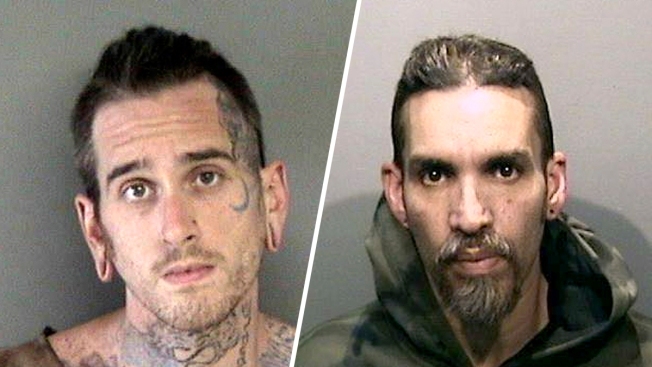 Max Harris (L) and Derick Almena (R) have pleaded not guilty to involuntary manslaughter charges in connection with a fire in an illegally converted Northern California warehouse that killed 36 people. A top Oakland Fire Department official said Wednesday that investigators never determined the cause of the fire at the Ghost Ship warehouse last year that killed 36 people but she thinks it was caused by some type of an electrical problem. Acting Assistant Fire Marshall Maria Sabatini said in the preliminary hearing for Ghost Ship master tenant Derick Almena, 47, and creative director Max Harris, 27, on 36 counts of involuntary manslaughter for the blaze at the warehouse at 1309 31st Ave. on Dec. 2, 2016, "It most likely started with a fault or failure in the electrical system." Sabatini said, "There were a tremendous amount of items that were electrical in nature," such as cooking materials, extension cords and two refrigerators. Sabatini also said, "There was an excessive amount of flammable materials in live-work spaces throughout the first floor" at the warehouse, which is where investigators think the fire started. She said, "The sheer amount of those materials would have contributed significantly" to the fast-spreading fire, which occurred while an estimated 100 to 120 people were attending a music party on the warehouse's second floor. Sabatini testified that investigators also never pinpointed the exact area where the fire started, but they think it was generally in the northwest corner of the warehouse's first floor. Prosecutors allege that the warehouse was in violation of several rules under the California Fire Code, such as not having adequate, fire-suppression systems, smoke alarms, exit signs and sprinklers. Prosecutors also allege that the industrial building wasn't zoned for residential use and that Almena and Harris remodeled the warehouse without going through proper inspection and permitting procedures. The purpose of the preliminary hearing, which has lasted five days so far, is to determine if there's enough evidence for Almena and Harris to be ordered to stand trial. It had been expected that the hearing would conclude Wednesday, but defense attorneys delayed the hearing by questioning the qualifications of Oakland Fire Marshal Miguel Trujillo to testify as an expert on California and Oakland fire codes. Curtis Briggs, one of three attorneys who represent Harris, spent about 20 minutes asking Trujillo about his credentials, asking him detailed questions about what classes he's attended about fire codes, the last time he was certified, how much he paid to be certified and about the legal definition of a warehouse. Tony Serra, one of two attorneys who represent Almena, complained to Alameda County Superior Court Judge Jeffrey Horner, who is presiding over the hearing, "There's not an adequate record to make him (Trujillo) a first-time expert" on fire codes. Horner said he will rule on the issue of whether Trujillo qualifies as an expert on Thursday morning, when the hearing resumes. During a break in the case Wednesday, Serra said, "It's very difficult to assign culpability to the people who are charged (Almena and Harris) when they (fire officials) don't even know the cause and origin." Earlier Wednesday, federal Bureau of Alcohol, Tobacco, Firearms and Explosives agent Whitney Hameth testified that Harris told her after the fire that he knew the warehouse didn't have sprinklers, but he didn't do anything about it. Hameth said Harris told her, "He was aware they didn't have sprinklers but never thought to ask the landlord to put them in." Harris' attorneys have sought to downplay his role in running the warehouse, which also was known as the Satya Yuga Collective, but Hameth said Harris described himself as the building's creative director, and in his emails to her, he listed himself as the "Executive Director of the Satya Yuga Art Collective." Hameth said when she interviewed Harris on Dec. 5, 2016, three days after the fire, he told her that about 100 to 120 people attended a music party on the warehouse's second floor and Ghost Ship leaders blocked off many areas on the building's first floor. Hameth said Harris said, "The only thing that was open downstairs was the hallway."